SOUTH BEND, Ind. (AP) — Blake Bars walks every day to law school past the house that Rockne built, where on Saturday night his former team, No. 14 Michigan, will visit No. 12 Notre Dame to kick off their seasons. 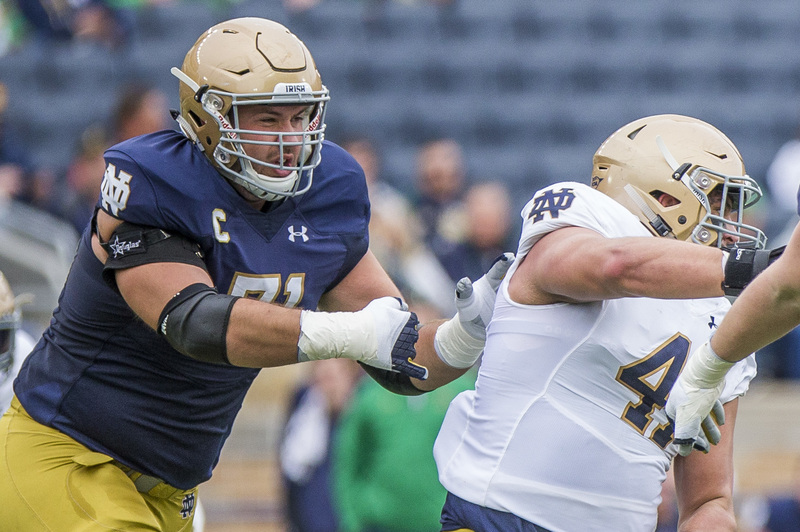 At night, he heads to his off-campus apartment where his roommate is younger brother, Alex — the starting left guard for the Fighting Irish. “Blake is going to be cheering for Notre Dame — we’ve had this conversation with him,” joked the 22-year-old Alex, a 6-foot-6, 315-pound graduate student who moved from right guard to left guard in the spring to replace All-American Quenton Nelson, the top draft choice of the Indianapolis Colts. Blake, who handles the brothers’ bills when he is not immersed in jurisprudence, knows his place. History has its share of sibling rivalries. The DiMaggio brothers, Joe and Dom, played center field in the 1940s and ’50s for the Yankees and Red Sox (older brother Vince primarily played for the Pirates). The Harbaugh brothers, John and Jim, now the Michigan head coach, squared off in the Super Bowl. There’s no concern about any material leaking to the other team. No way. “Blake’s loyalties lie with Notre Dame more now, especially after spending more than a year here and understanding my loyalty to this program,” Alex Bars said. That’s music to the ears of their father, Joe Bars, a double Domer (undergrad and MBA degrees). Joe Bars played for Gerry Faust, too, as a linebacker. At the Bars household in Nashville, Tennessee, Joe and wife Sally, a former swimmer at Michigan State, were kept busy by both boys, their old brother Brad (a 6-3, 263-pound defensive end at Penn State from 2010-14) and younger sister Lauren, a sophomore volleyball player at Mississippi who happens to be dating Nelson, the NFL newbie. No one really knows how much damage was done to the house and furniture as the Bars boys perfected the pulling and blocking techniques they took to Montgomery Bell Academy Prep, where college recruiters couldn’t get their fill of film. Joe Bars gave up when the boys’ size and strength became too much for him and the workouts became “too fiery.” Some of the fire has been extinguished now that Blake and Alex are in South Bend where they share that apartment not far from campus with one of Blake’s law-school buddies. If there’s a rivalry, it’s in the kitchen. The pots and pans are on notice.